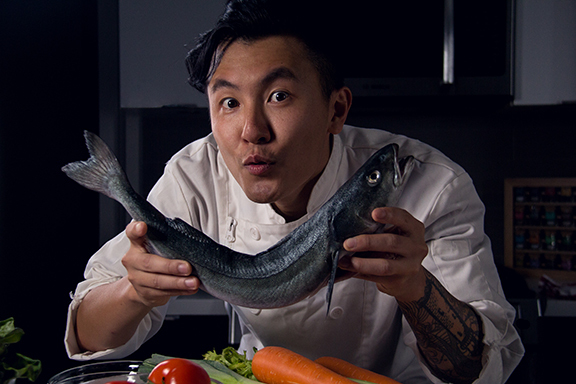 In part two of this two-part series, Derek Chan, co-artistic director of rice and beans theatre, reflects on the experience of translating Jovanni Sy’s hit play A Taste of Empire from English to his first language, Cantonese. Derek performed in 食盡天下 / Taste of Empire at The Gateway in Richmond, BC, September 15-17, 2016. It was January when I wrote Leanna Brodie a sheepish email, hoping to get some pointers on translation. Basically, I was looking for a What to Expect When You Are Translating. She replied warmly and suggested we should chat. So we had coffee at the Richmond Public Market, a small shopping centre with an authentic charm. She lent me some reading material to get me started: essays, interviews, panel discussions, things like that. We talked about translating, writing, and languages. (The history of Joual in French-Canadian theatre is super fascinating, by the way.) Leanna told me about her process as a translator, shared a few anecdotes and brought up a few key concepts of translation. Her advice and words of encouragement made me feel okay about not knowing anything about translating and diving head-first into it. A translator analyses the source text in such great detail – the tone, the meaning, the cultural context – there are so many clues to consider. It requires an immense dramaturgical focus in order to take in absolutely everything that is on the page. And then comes the wacky part: setting the output dial to “Cantonese”. Is there even a word for that in Cantonese? Will this joke even make sense for the Richmond audience? Is this metaphor too crass? Do I translate the essence of the sentence, or the meaning of the words? For example, I was trying to come up with a title in Cantonese. A Taste of Empire. There were two proposals. The first was 帝國風味, which literally means Empire[‘s] Flavour. The other one was 食盡天下, which means something like “Eating/consuming everything in the world”, or more literally, “Eating/consuming to the limits of the sky and earth”. Both Jovanni and I think this is a better reflection of the piece’s tone and themes. Plus, I like it because it is a bit more colloquial, with a little more oomph to it. This translation is alive. And that’s something that has stuck with me throughout the process so far: How do I bring this piece to life in Cantonese? The piece has to live. It can’t read like a stiff translation – I have read so many of those, and I will not be one of them. But at the same time, as a playwright, I also have to be conscious about how much of my writing persona I am allowing to slip into the piece. When I wrote the first draft of食盡天下(Sik Zeon Tin Haa) at PTC, I would find a Cantonese movie on YouTube (Stephen Chow, most of the time), plug my headphones in, listen to it in my right ear, and then I would follow the conversations in English around me with my other ear. Once I am all wired in, I would lay out Jovanni’s original in print across my desk. Three pages at a time, usually – so I knew where I came from and where I was going. Then I would write in Cantonese by hand on a recycled script notepad. So there I was, brows furrowed, scratching down strange characters on a notepad, pieces of paper everywhere. With me slouching in my chair and writhing at challenging passages and giggling at Jovanni’s or Stephen Chow’s jokes and chuckling at the odd witty little Cantonese pun I stumbled across in my head, I must have looked like the test subject of a secret science experiment. I will always cherish this feeling. The feeling of doing something for the first time. I find it harder and harder to come by every day, and I am not even 30 years old. Okay, sure, I wrote the first draft by hand partly because there wasn’t a program to type Cantonese on my work computer, and a solution has been found since. But writing by hand is something I find myself doing more often these days. It made me write more carefully. There is a sense of finite permanence when you are writing by hand. There is no backspace key, no undo button. The ink will eventually run out and your hand will cramp up at some point during the day. Every stroke of the pen became more sacred because of that. My respect for words and languages grew. It brought the romance back. There are two ways of writing Cantonese. There is “the proper way”, and there is way it should have been written. In school, we learn to write “the proper way”. Ignoring the slightly tangential topic of traditional versus simplified Chinese, this is basically how everybody is supposed to write these days. Because that is how sentences are formed in Mandarin, the official language based on a Northern dialect. It is all fine and dandy if you’re a Mandarin speaker, I suppose. You write like you speak, lucky for you. Sure, there are certainly similar and even interchangeable turns of phrases between the “proper written way” and colloquial Cantonese. So it’s fine, since we share most of the characters, we can definitely read “the proper way” out loud using Cantonese pronunciations, and it would make sense. Problem is, nobody speaks Cantonese like that. Not ever. Actually, in the very old days when there were still emperors and dynasties, way before premium imported opium and the Brits, the prevalent Chinese variant sounded more like Cantonese than Mandarin. Old poems rhyme better if you read them in Cantonese. Still, in schools we were taught to write the proper way, even if it is not the way we normally communicate with each other. While there should be nothing wrong with writing Cantonese as it is spoken, even to this day I feel a little naughty doing so. After all we were taught writing Cantonese on paper is improper and uneducated. In fact it is quite the opposite. The Cantonese language is vibrant and fluid. It ebbs and flows in its sounds and imagery (swearing in Cantonese is especially satisfying). Don’t believe everything they teach you in school, kids. Since 食盡天下is a theatrical text, I have made the choice to write it as it is spoken. Don’t get me wrong, I am not saying Death to “the proper way”! There is definitely a time and a place for it. And I would never, ever wish death to any language, written or spoken. All I am saying is that no one should feel naughty scribing their mother tongues. Since the beginning of my translation journey, I have spent a lot of time researching the proper way to write Cantonese as it is spoken – the right words to represent the right sounds, etymologies, and historical context. I find it slightly amusing that my latent intimate relationship with Cantonese came about in such a typical but roundabout way. We have all heard this story before: They were childhood sweethearts. Teenage Derek was an angry, confused jerk and they broke each other’s hearts. He left Hong Kong, and home didn’t feel quite like home anymore. A decade and a half of silent resentment followed. They almost forgot about each other. One day, they stumbled upon each other in a port side city on the other side of the world. Now grown-ups, the childhood sweethearts decide to give it another go. Despite all the baggage they carry, they know that there is no one else in this world that knows them better. I wonder what my dad is going to think when I send him a draft of 食盡天下. Or this blog post. I sometimes make fun of Pedro [Chamale, Derek’s co-artistic director of rice & beans theatre] about his mistakes when I read his plays. It’s not very nice of me to point them out, but I have never confused your with you’re; too with to; or their with there. However, I have caught myself mixing up homonyms in Cantonese more than a handful of times. It must be a first language thing. If only Pedro could read Cantonese, he would have a field day with all the silly mistakes in my first draft – I am just as bad as he is! As I was reviewing my preciously handwritten first draft, I caught myself making quite a few schoolboy errors: confusing one word for another (similar to their-there); or completely botching the composition of certain characters (similar to spelling mistakes). I suddenly found myself marking the script with a pen, correcting my mistakes like my dad used to do with my essays when I was small. My handwriting was embarrassing in the beginning. The first two pages were squiggly chicken scratch. It was a horrific sight. I looked down at the page and could not recognise myself. So I desperately tried to remember how I used to write. It felt like drawing a portrait of my teenage self from memory. I couldn’t remember. Then something happened from page three onwards. The words looked like the handwriting of yet another person: the lines were straighter, the corners were sharper. It still didn’t look like me and it wasn’t perfect, but it was a clear improvement. Another thing I noticed is that as a writer in Cantonese, I am quite a bit crasser and more colloquial. Funnily enough my writing feels a little more at ease. It makes sense, as Pedro pointed out once, since it is my first language. He could always tell, he says, because the body sits a little differently. And I agree. I do present myself and behave slightly differently, depending on which language I am speaking. Recently, I had a major trivial epiphany. It was an epic realisation about a trivial issue. After moving here, I found myself confusing the cardinal directions a lot. Rationally, I understand the concept that in Vancouver, Mountains=North. But for some reason I still get turned around more often than I thought I would, even though I have lived in Vancouver for just over a decade now. It was amusing and confounding. Then, about three months ago, I realised what has been happening. but in Cantonese, directions go like this: East-South-West-North! Now I have something to blame my disorientation on, finally. Finally! I’m not stupid! I have just been thinking in the wrong language all along! Ever since I have made a point to do my cardinal directions in Cantonese, I don’t think I have ever got lost because I confused east with west. However, my brain still uses English when it comes to things like turn left, merge, yield, red light. So, do I think in English or Cantonese now? English, for the most part. That’s because English is still the language I use most often. However, there are certain categories of thoughts that my brain processes better in Cantonese: dealing with my parents, cursing, humour, and the multiplication table, to name a few examples. Things I learnt before I left. Dis-orient-ation… Confusing east with west… trying to make a point, Derek? Cantonese and I are frenemies. We have been tumbling down this never-ending bumpy path for the better part of the last three decades. Sometimes in a headlock, sometimes an embrace. Translating A Taste of Empire into 食盡天下is monumental in both my artistic and personal growth. This project has forced me to examine my mother tongue more closely, and by extension, a large part of my identity. Cantonese is where I began as a human being capable of expression and articulation. This is what I am, but this is not all that I am.